What is your earliest memory? What does it look like? What does it sound like? Who else was there? Why do you think you remember this particular thing? When you think about it, how does it make you feel? Stepping away from the screen is becoming a bit of a hot topic. Here are some articles, posts, and magazine covers that sympathize with our mission. 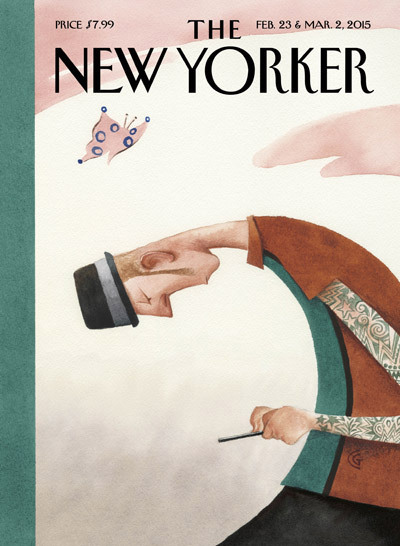 Illustration by Carter Goodrich for The New Yorker. 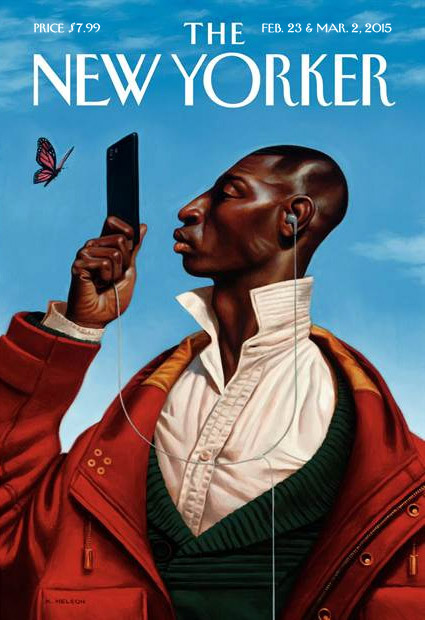 Illustration by Kadir Nelson for The New Yorker. by Victoria L. Dunckley M.D. Here’s an archive of past prompts and challenges. Just because they’ve already happened doesn’t mean they can’t still inspire you! Use this list liberally! Do you have any unfulfilled desires? Anything in your life that makes you say, “I wish I had _______________”? How does that make you feel? Regretful? Lazy? Resolved? Why do you think you didn’t do that thing you wanted to do? Was it too difficult? Not enough time? Too many distractions? Write a letter to an important person in your life. It can be a relative, an old teacher, a child, a counselor — anyone who has impacted your life in a strong way. Tell them how you feel about them, and why. Send it immediately! Summer rain showers make me think of _________________. When I think of the first day of school I feel ______________________. What is something that annoys or irritates you? Take that irritation and reframe it into a solution to a problem. Have you ever left something behind? How did it affect you? When I walk outside on a winter day, it makes me think of ____________. Create something based off a CIRCLE, a TRIANGLE, or a SQUARE. Draw something without looking at the paper. Then turn it into a finished drawing. School’s (almost) out, pools are open, sleeves are short, toes are finding sand. It’s June!! This month is all about freedom and spontaneity. With a whole summer of warm days and late nights yawning out before you, anything can happen! I say let’s give in to IMPULSE and make the first thing that comes to our mind. Stop right now and think of making something. Are you painting? Molding something with clay? Cutting paper? Writing a story? Printing some photos? Welcome to July, friends! It’s the month of independence. But here in the USA, over the past few weeks, rights, privileges, and liberties are being discussed in complex and serious ways. What does FREEDOM mean to you? Have you been impacted — directly or indirectly — by the recent events? Are there other issues of freedom that are dominating your attention right now? Are you just looking forward to watermelon, bbq, and fireworks on 4th of July? Or is it some complex, human combination of all of those? Regardless, spend some time thinking about freedom, and use those thoughts to inspire you to step away from the screen and make something this month. Someone said to me recently, “Screens keep me from being able to do the things that make me happy.” Do you find that statement to be painfully true? I did. Summer’s last chapter is upon us — school has even already started for some people — so it’s time to make the most of the days we have left. Put your screen down RIGHT NOW and go do something that makes you happy. It can be anything, not just making something. Play 18 holes of golf; drive to the mountains for the weekend; call a friend and take a walk together; read a book you’ve been meaning to get to; send a real birthday card to someone; get an adult coloring book and color page one. Whatever it is, just go do something that makes you happy. Your challenge this month is to create something out of those decidedly different colors. What are they? What do they feel like to you? What do they communicate? Pull out your favorite comfy sweatshirt, take a deep breath of that new, cool air, and go create something! Welcome to a fresh new year with fresh new opportunities that stretch so far out ahead of you that you can’t possibly see the end! They’re so fresh! You have all the time in the world! What do you want to do with it? Now’s your chance! That overwhelming project that you didn’t think you had time to do? It’s time to start! Need to take a day all to yourself to focus? You’ve got a whole year — take that day! Feel like doing something frivolous, just because? Yes! Do it! The time is now. Make a fresh start and do something that makes you happy! Have you ever found yourself wishing you had just one more day to do something? An extra day in the week? Or even a few additional hours to spend with someone you love? Well now’s your chance — it’s LEAP Year! This means you have been given the gift of a BONUS DAY this month! For your February challenge, I want you to take a minute to think about all the things you would do if you were granted your wish: An extra day that has no expectations piled on top of it, no obligations, no responsibilities. You’re free to do whatever you want. What are you going to do?? Step away from the screen and do it! March is supposed to be the windy month, right? The month where winter blows out the door and spring takes its place. It’s a redolent, evocative, and sensory time of year. So this month, I have chosen four words to inspire you. You may be as literal or fanciful as you like. The words are a starting point, intended to spark an idea; not to restrict or confine you. Be free, be loose, be literal. Whatever comes to mind. Although April is the month we usually associate with Spring, it starts off with a foolish bang. Pranks, jokes, and laughter fill the day on April 1, as kids all over the country put rubber bands around their sink sprayers, and parents freeze poured bowls of cereal. For your challenge, take inspiration from April Fools. This month, create something that makes you laugh, either because it’s funny, or clever, or foolish, or happy. Have fun! For anyone involved in school in any way (student, parent, teacher, etc.) May is a crazy month. Between end-of-year testing, end-of-year picnics, end-of-year teacher gifts, end-of-year goodbyes, and making summer plans, there’s not much time for sitting still. For your challenge this month, spend 10 minutes sitting still, breathing, letting your mind float. Call it meditation, call it focused breathing, call it putting yourself in time out. Whatever you call it, go do it. While you’re there, whatever your mind goes to that doesn’t involve being busy, use that as the basis for a creation.